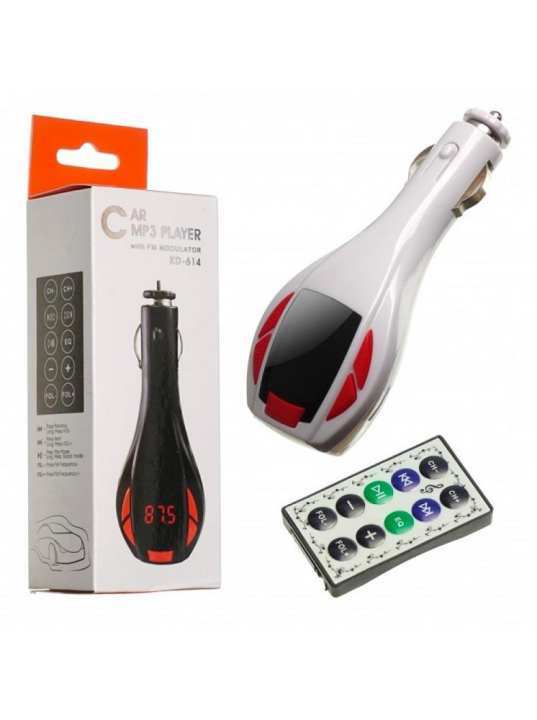 The Fm-transmitter (modulator) KD-614 is a unique device that will complement the arsenal of the car's speaker system and will become an indispensable accessory for the driver. The advantage of MP3 FM modulators is that this device combines both the MP3 player and MP3 transmitter and at the same time has miniature size and maximum functionality. And what is important - does not require additional power. An FM transmitter (modulator) is a device that allows you to stream MP3 music files to the FM radio wave. With this device, any car FM radio acquires the functions of a full-fledged MP3 player. To do this, simply insert the FM transmitter and connect to it a USB flash drive that contains MP3 music files. After that, you need to configure the FM transmitter and car radio on the same frequency.Transmission of sound in the FM-band is in high-quality stereo mode. On-screen display: FM wave number, track number.